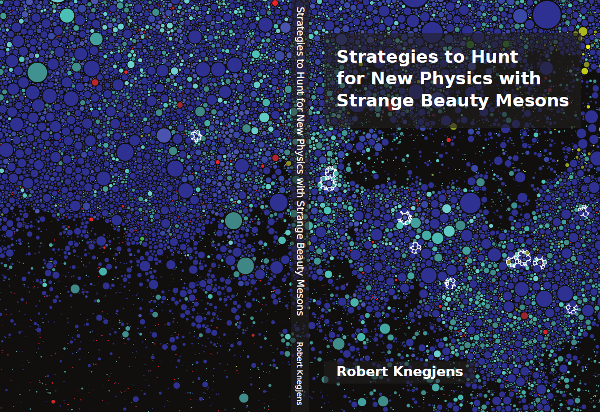 The title of my Ph.D. thesis is Strategies to Hunt for New Physics with Strange Beauty Mesons. I publicly defended it at the Vrije Universiteit Amsterdam on the 11th of March 2014. Before the defense I gave a 10 minute lay presentation to the public. At the VU online library the lay summary chapters of the thesis, in English and Dutch, are linked to separately. From the inside cover: ... an image generated by the Paperscape project on which the author worked together with Damien George. It shows a map of scientific papers drawn as circles, which have been been arranged according to how they cite each other. The map is zoomed in on the flavour physics peninsula, and the author's papers have been highlighted by white halos. There is a photo album from the day. At the party that evening my two paranymphs Jan Weenink and Mert Aybat prepared a website presentation that they called robscape. During my Ph.D. I kept a brief and infrequent weblog that detailed some of my progress. In terms of papers, we published two in April. One dealt with a general discrepancy between how Bs branching ratios are experimentally measured and how they are theoretically computed. This effect is due to the decay width difference of the Bs mass eigenstates and can be as large as 10%. The other addresses this feature for the rare decay Bs → μ+μ- and points out that, aside from the branching ratio, the effective lifetime is a complementary experimentally feasable observable for detecting New Physics. In August we published a paper on the decays Bs → Ds±K&mnplus; as a means of extracting the CP violating angle φs + γ and a couple of weeks ago I submitted my proceedings for the 4th Capri workshop on flavour physics. On to talks. As I just mentioned, I attended a workshop on flavour physics on the island of Capri in Italy where I gave a talk. It was a very nice workshop, of which I've uploaded some photos too. I also gave a presentation in the new talents session of the International School of Subnuclear Physics in Erice, Sicily. Also very pleasant, and similarly also an album of that. Finally, last week I gave a similar talk at the Nikhef TPP meeting. Over the summer Meri and I went backpacking through Eastern Europe. Specifically, we took the train from Amsterdam to Croatia, stopped for a week of diving and then went from Croatia, through Bosnia, Serbia and Bulgaria to Istanbul. We flew back. It was an amazing trip, with very nice food and not a single day of rain. Also plenty of photos from this trip. Note that I've decided to stop using Picassa for my later albums as I don't like how they're trying to integrate it with google plus. Now hosting them on my own server. In two days I fly to New Zealand to celebrate Christmas with family and attend a wedding. I'll be back early in the New Year. Last month I attended the CERN European school in Romania. The school took place at a resort in the beautiful Carpathian mountains in Transylvania. Afterward we spent some days in Bucharest, which pleasantly exceeded my expectations and I also made a brief trip to Ploiesti to visit a friend. I've uploaded photos of the trip, which admittedly includes a lot of borrowed photos. In September I had two new publications. 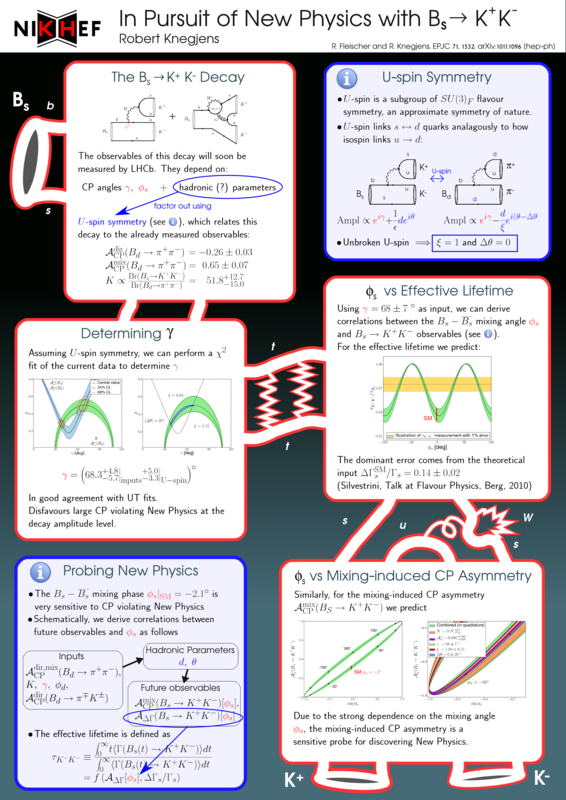 One examined the theoretical uncertainty of the Bs → J/ψ f0(980) decay channel, which has recently been hailed as a competitive channel for measuring CP violation in Bs mixing. 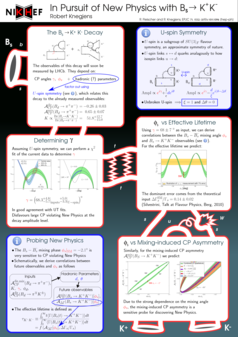 The other demonstrates how the effective lifetimes of Bs meson decays can be used to constrain the Bs mixing parameters. 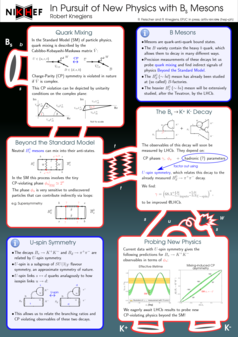 I have recently made two posters presenting our work on the Bs → K+K- decay. The first I presented during the FOM 2011 conference in Veldhoven in January, which was attended by a general physics audience. The second I plan to present next week at the Beauty 2011 conference in Amsterdam, and is therefore aimed at a more expert audience. To design the posters I used the open-source desktop publishing program Scribus. The thumbnails below link to full-sized (png) images. In February this year I attended the DRSTP winter school in Campos do Jordao and Sao Paulo, Brazil. Afterwards I spent another two weeks travelling around Brazil, specifically seeing Igauzu, Ilhabella, Paraty and, last but not least, Rio de Janeiro for carnival. See the photos page for evidence. 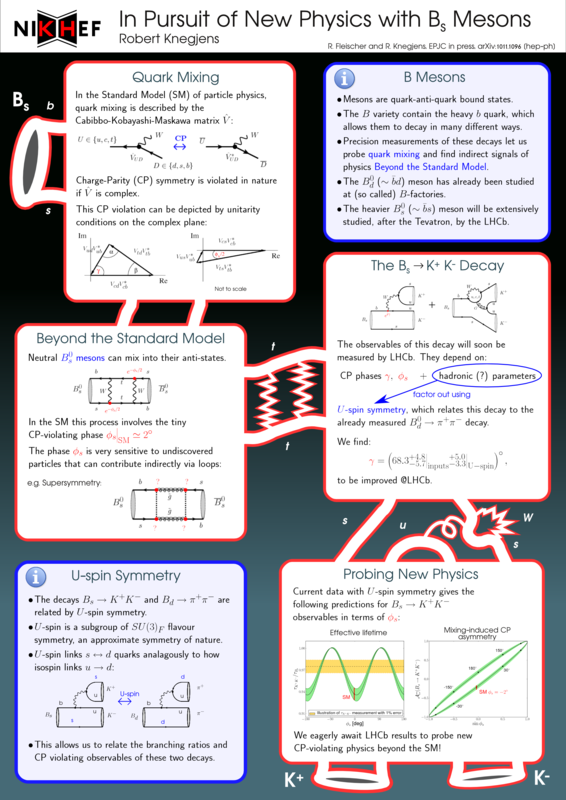 I have a new paper on the arXiv: In Pursuit of New Physics with Bs -> K+K-. It concerns correlations between the experimental observables of this decay and the Bs mixing phase. The latter is very sensitive to new physics beyond the Standard Model and should soon be measured by LHCb at CERN. I presented this paper last Friday at the NNV meeting in Lunteren. The preprint paper I mentioned in my last post has now been accepted for publication in Physics Letters B - this link won't get you further than the abstract without a subscription, so, in case you're interested, you can find the full thing on the arXiv. I've recently moved to Amsterdam after three years in Utrecht. My new flat is on Java island in the IJ harbour, where I moved just in time to experience SAIL 2010. I've uploaded new photos of Amsterdam as well as Meri and my summer holidays in France and Poland. My first preprint is up on the arXiv: Single top production in a non-minimal supersymmetric model. This paper was based on my master's work. There are newly uploaded albums of Meri's and my return to Valmorel in March and a city break to Antwerp two weekends ago. I've been back from my New Zealand trip for just over a month now, and officially started my phd on flavour physics phenomenology with Dr Fleischer on the 1st (of this month). I've recently put up two photo albums of my trip. I've also got around to fixing a bug in the deformable project source code so that the surface will no longer blow up in your face! Seeing as it's working again, I've put up a video recording of the surface in action. Happy new year:) I was in Picton over the new year where I followed the PADI open water diver course. My backpacking cousin Ted also joined me for these four nights. Today Meri flies in to Westport. In a couple of days we plan to make a south island roadtrip. I'm currently holidaying at my parent's place in Westport, New Zealand. On the 18th of Jan I fly back to the NL, and will be starting my phd on the 1st of Feb.